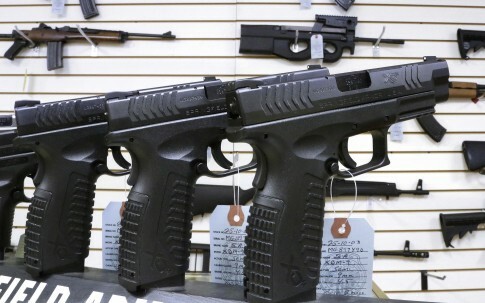 The state of Maine became the sixth in the country to allow citizens to carry firearms without the need to obtain a permit on Wednesday. Gov. Paul Lepage (R.) signed Legislative Document 652 into law Wednesday, creating the state's new permitless concealed carry framework. The permitless carry, commonly referred to as constitutional carry by gun rights activists, allows anyone over the age of 21 to carry a firearm so long as they legally own the firearm. Felons and other criminals are still prohibited from carrying a firearm. The National Rifle Association (NRA) celebrated the move as "another victory for gun owners." "Maine now joins an ever-growing number of states in passing permitless carry," executive director of the NRA's Institute for Legislative Action Chris Cox said in a press release. "Despite the best efforts of Michael Bloomberg-funded groups to distort the truth, the Maine legislature and governor stood strong for freedom. It’s encouraging to see a governor stand up for the rights of their constituents, instead of caving to the demands of an anti-gun billionaire from New York City." "On behalf of the NRA's five million members, we would like to thank Gov. LePage, Senator Eric Brakey, and the House and Senate leadership for their work in pushing this legislation through." The National Association for Gun Rights (NAGR) also celebrated the new law. "We’re very pleased the governor signed this landmark pro-gun bill," NAGR president Dudley Brown said in a release. "We would like to thank pro-gun State Sen. Eric Brakey for sponsoring this bill, and we’re especially grateful to the NAGR members and supporters who took action to support this bill." "We are so excited that both Kansas and Maine passed constitutional carry this year," Brown said. "This is a first that all pro-gun people should be proud of." Gun control groups including Everytown for Gun Safety and Moms Demand Action for Gun Sense in America condemned the passage of Legislative Document 652 but did not release a statement on it becoming law. Maine joins Alaska, Arizona, Kansas, Vermont, and Wyoming in removing permitting requirements for concealed carry.